Networking and close relationships are key to winning over high-potential Canadian customers. For Canadians, France is an important export market. For the furthest away, an 8-hour flight is required, without counting stopovers. Careful planning, a convincing argument and market knowledge are therefore required to win and nurture the loyalty of these visitors who have considerable purchasing power. 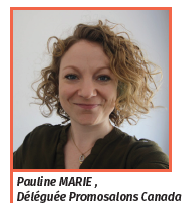 The Promosalons Canada team has close ties with all actors in the Canadian market, whether companies, the specialist press, federations or associations and government. Relationship marketing is essential to create confidence, bolster trade show visibility and foster long-lasting partnerships. Regular telephone calls can be used to share trade show news, but also to assess visitor satisfaction, answer their questions and ensure subsequent emails are opened. Networking events are effective for maintaining ties and extending the local office’s network. Once secured, Canadian clients like to use a local contact to help with their formalities (pre-registration, organisation of visits or even assistance at the show). In some sectors, forming delegations is a good way of increasing visitor numbers. Digital communication is also promising in this highly-connected country. Facebook is especially popular. For other platforms, the choice depends on the sector (for example Instagram is preferred in design and Twitter for the environmental sector and retail). The local Promosalons office publicises trade shows and develops partnerships with opinion-makers. These activities may include offering invitations in exchange for visibility on the relevant platform. Monitoring is essential to detect strategic information and opportunities for organisers. The local office opened in 1987, and Pauline Marie enthusiastically seized the reins at the end of April, following the diligent and much-appreciated work of her predecessor, Christelle Rey.